A cool factory option on your Camaro was to have the exterior door handle inlay area covered with a color keyed decal to the body paint color. We offer the factory colors plus many more custom colors. 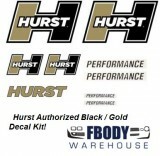 At the best price in the industry to your door AND the best quality Fbodywarehouse has the inlay decals you need for your 1974 1975 1976 1977 Camaro! This is a pair of colored door handle inserts for 70-81 Camaro and Trans Am outer door handles. CHOOSE YOUR COLOR NEEDS!! For your Camaro Firebird & Trans Am! Reminiscent of the iconic Hurst Performance cars built and offered throughout the muscle car era, this Hurst decal pack allows you to set your car apart from the crowd. Constructed with the highest quality gloss vinyl laminate materials and made here in the USA, these adhesive graphics are easy to install using the included applicator and detailed instructions. Although these were originally intended for the front quarter panels, rear deck and hood, they can be installed in just about any location desired. The kits are offered in two color combinations; Red/Black/White and Gold/Black/White and have been carefully designed to show well over any paint color. 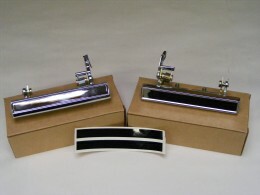 This is a set of two 1976 - 1981 Trans Am Bandit Door Handle Decals. Be creative and make your own. Choose from German style font or standard block font. Also choose your color lettering. You can have up to 14 characters including spaces. To enter your custom lettering, please put in the note section at checout what you would like them to say.